Creativity, artistic talent and imagination are qualities of a good interior designer. An interior designer job is a truly challenging but rewarding experience. In this job, you have to be creative yet practical at the same time to achieve the desired results in meeting the demands of your clients. Your job as an interior designer may include planning and organizing internal spaces in buildings and other structures. You may also be required to produce designs for businesses, homes, hotels, public building, ships and aircraft. To be an interior designer, you have to be part artist and part business professional. While an interior designer job is exciting, it is not all glamour. You must know how to handle people, work within a budget, and excel at client relationships. You do all these while designing beautiful, functional spaces that meet building and safety codes. Part of an interior designer job is to meet and negotiate with clients. You will have to prepare basic design sketches for the client’s approval. This will include color schemes, lighting, furnishing, fabrics, etc. You will also have to provide the client with cost estimates. Once the design has been finalized and approved, you will also help to monitor the progress of work if the client requests this. If you are new at the profession, you will have to work your way up the ranks. Your first interior designer job will most likely be as an assistant to an established interior designer in one of their many projects. This is an excellent opportunity for you to gain experience and connect with others in the interior design industry. There are a number of career opportunities within the industry. You can specialize in interior decorating, interior design, commercial interior design, lighting design, set design, space planner, exhibit design, and the like. 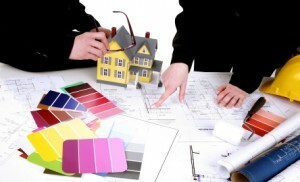 An interior design degree gives you the opportunity to learn all of these specialties. Interior design programs usually take four years to complete, but you can attend an online school or work for an AA degree that will put you in the work force much faster. With a degree in interior design, you can join a company and have an interior designer job as trainee. Use this opportunity to learn all you can and gather experience that will serve as a solid foundation to build your skills. You may also choose to be self employed. This career option is best suited for those with plenty of experience in the industry. You will not be receiving a regular monthly income but you will have flexible hours plus the prospect of earning potentially unlimited income.